Oh no! Avoid sinister underwebs!! Developing the best governance framework will give the right support to your intranet and organisation. 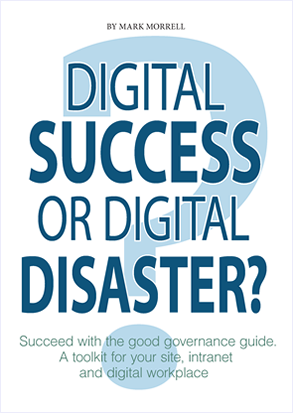 Don’t forget your governance needs to help, not hinder, how people use the intranet. That is the best way that your intranet can support your organisation’s goals. Governance needs people using your intranet to be confident in the integrity of the information and tools every time they use them. They can always rely on your intranet helping, not hindering, them with their work. If your ‘Official’ intranet is designed and branded to a very high standard, containing all the information people should need but rarely use, the problem is probably that governance is too rigid. Publishers must follow a complex process especially when it comes to branding for the ‘Official’ intranet. If their site has an image that deviates by a few pixels it can’t be published. Yes, it can be that tight! To add to their misery, the steps to final approval are onerous and take a lot of time and effort. Naturally, publishers become frustrated and look for other options to publish their content more easily. Over time, an ‘Underweb’ starts to sprout up and competes with the ‘Official’ intranet. If left unchecked, you can have a bizarre situation with an ‘Official’ intranet looking beautiful, on-brand, but little content that people need for their work. Conversely, the ‘Underweb’ thrives although it is not completely on brand. It has information and tools that people use for their work and it’s easy to use. You need a good publishing experience as it is easy to create content and make changes to meet people’s needs. You also need a user experience that is good enough. The lesson here is to remember the purpose of your intranet. It is to provide the information and tools that people need to help them. Your governance must support this. Research with people using your intranet what they like most and what they do not. It will quickly help you to assess if your governance is helping or hindering people’s use. This means you need a publishing process that is both easy to use and compliant with your publishing standards. You also need people using the intranet to have a consistently good experience. Achieving the needs of both groups means you will have more productive and effective people. That is what your organisation needs most of all. Find out more information on how to avoid sinister underwebs from my new book ‘Digital success or digital disaster?‘. Read the introductory chapter to find out more. A license to share the ebook with publishers across your organisation is available. Is your digital workplace experience good or bad? Intranets are now at a jumping off point to become digital workplaces. In 2015 organisations are no longer just talking about ‘digital’. People are increasingly using different methods to connect whenever they need to. When they connect it is to find information, use apps, share some news or ask for help with a work problem. In my last post I recommended you have clear business requirements, the right direction set with a strategy, support from your stakeholders, and measures agreed that can demonstrate the benefits of your approach. Within a governance framework you need to implement publishing standards for everything people use across your digital workplace. People need to be familiar with what they access, no matter what device they use. This saves time with people not stalling while they check everything before they start using it. This is easier said than done though! Firstly, you need to identify your business requirements for your publishing standards. Once this has been done, you can then develop what publishers need to do to implement each standard. Ownership: Every piece of content and app has an owner who can be contacted for further information. Think about how you need to show this for each device people may use. Timeliness: Every piece of content has a review date that gives people confidence they can rely on it being accurate and current. Again, think about how this can appear for every device. Findability: Every piece of content and app, in whatever format is needed for each device, is indexed by your search engine so it can be found quickly. Making sure it is properly tagged by your publishers will also help people find what they need more easily. Usability: Every piece of content and app should consider mobile users first. That can be a big change of focus. More and more, people will use a smartphone or tablet to access what they need. Test your content and apps with these devices to get the user experience right. Navigation: Every piece of content and app needs to be linked together so you can quickly move from one to the other. Menus need to work with every type of device and will need testing before implementation. You don’t want oasis of content that are disconnected from each other by a digital desert. You will need to include in your governance framework how you can achieve this. Publishers will need to be trained on how to use the publishing tools obviously. For collaboration tools that really should be by following simple guidance because they are very easy to use. However it must also cover what your publishing standards are, why they need to be implemented and most importantly, how that will be achieved. You need this for a common platform of knowledge and understanding across your publishing community. Follow up the training for your publishers by educating them with simple processes to publish content, develop apps, etc., and support their publishing needs with guidance, Frequently Asked Questions, discussion groups. Taking this approach will help give people a consistently good experience every time, with every device, from every place to successfully transform your intranet into a wider digital workplace. Publishing content: Use it, don’t abuse it! Content that is easy to use does not appear like that by magic. It is having standards on usability, supported by training and guidance, that helps to make this happen. Information must be usable and valuable to people who need to use it. Features and functionality need to make it easier for people not just implemented for the sake of it. They should help people to share views, discover other people and their skills, find the right information and use what they find with the minimum of effort and time taken. Your publishing standard should encourage employees to engage and influence the look and feel of your intranet as well as sites, applications, and tools. Embracing this approach through research, feedback with clear and transparent methods will help embed this and help to improve the overall consistency of your intranet user experience. You can encourage your publishers to use the publishing templates with the usable design, layout, features and functionality be showing that more will use view their information. Your organisation can be reassured the investment made in your intranet is justified by the increased use made by people to help with their work. The main point is to create an overall consistent experience for people whatever device they use. With more mobile devices than traditional PCs being sold now, organisations should put the need of mobile people first. By removing the barriers, mobile users don’t need extra logins to be able to collaborate online. It should also be possible to collaborate while offline and the tool synchronise and update automatically. Research with mobile users what they need most to help them collaborate online, what experience it needs to be and identify tools with the best adoption rates and understand why. It is important that any governance is built to help people collaborate while mobile and not hinder this aim. By extending existing publishing standards to cover mobile use appropriately you continue with one governance framework. The same applies to roles and responsibilities for content and app owners as well as intranet managers. The findability of content is critical. Having one search engine that covers all the information architecture helps to achieve this. The decision over whether you have one version of the content or app which is responsive to different designs or different versions for each size screen will depend on the information architecture you develop and on security needs. How long is it before information become knowledge? Your answer to that will decide whether all your collaborative content stays online and is searchable or is archived after a period of time or inactivity or removed permanently. There are no right or wrong answers but you do have to decide what is best for your organisation. Make sure you have the right solution for the right business requirements. This means being very clear what you need before you start to research the technology that can meet your business needs. It will probably also mean you don’t choose the top solution, partly due to the costs, but also because it provides features and functions that you have no immediate or foreseeable need for. Any technology for mobile collaboration bought or developed needs to be configurable and shown to work with existing systems and platforms. You need to consider how many operating systems your organisation will support for the different mobile devices used for mobile collaboration. This needs to cover the issue of BYOD. A balance needs to be struck which may be something like x number of operating systems will be guaranteed to give a good mobile user experience and support y mobile devices. You can choose other mobile devices but you should not expect to be guaranteed a good mobile experience. You should not assume what collaboration tools people with mobile devices need. You need to research their needs not just make something accessible from a mobile device and say the experience is good enough. Involve people at the earliest stage of developing the user experience. As soon as the development is good enough for basic use it should be thrown open to mobile users to test out. They can feedback any problems or improvements that will help them to collaborate better to be acted upon. A perpetual beta development status can be adopted for the mobile collaboration tools to avoid long delays in improvements, the need for major re-launches. Small, incremental, changes can be made quickly based on clear feedback and involvement from mobile users. Lastly the testing can be a formal User Acceptance testing approach or more informal and open to anyone with a mobile device to use at any time. The process needs to be transparent and a playground/sandpit available where all development can be tested out. This may need IT to change its approach! This week I will be running a workshop on mobile collaboration at the World Class Mobile and Social-Enabled Enterprises event on 5 and 6 June in Frankfurt, Germany. While I will be focusing on how to make it easier to collaborate while mobile, this post covers the wider area of collaborating online. Most importantly how it can increase employee engagement and how that benefits an organisation. Many people are now very savvy about how they use the internet to share knowledge, build up contacts, help solve a problem. This especially can apply to new recruits who choose your organisation to work for. Easy to use tools: remove any barrier that may prevent people using these tools. If there is one, people tend to use it as a reason not to use it! Improve the culture: make it easy for people to share problems and want to share their knowledge and be recognised for doing this. Change how people work: empower people and allow them to collaborate when they need to – this means considering mobile and remote working rather than always working at one place. The bottom line: be able to measure the benefits to your organisation – increased sales, more productivity, higher customer service. My first-hand experience at BT and from working with clients is you can increase employee engagement because people want to work for an organisation that values collaboration. It is your approach which is critical! In this series of posts ‘Showing the value of your information’ I help you with tips and advice. So far I have covered owning content, accredited content and collaborative content. I now want to cover findability of your content. By findability I mean how you can make it easier for people to find the information you publish and manage. Making that difference will show that your content is more valued by anyone finding it. Think about the title of your content. What words or phrases will people be searching for? For your content to be high in the search results you need your title to be clear and meaningful to your intended audience. Any tags or metadata you add should help people understand your content when they find it. The aim is to help people find your content more easily and not need extra time and effort to do this. The sad truth is people rarely do this. For example the title ‘Is SharePoint good or bad?‘ is clearer compared with ‘Is some Microsoft technology better or worse than average when compared with other publishing tools?’. Avoid using jargon such as abbreviations or abridged versions of a word. Always use the terms most people are familiar with and will recognise when they are searching for your content. For example when I used to work in BT (a technology company) the term ‘broadband’ was also known as ‘DSL’ by technical people or ‘BT Infinity’ and other product names by Marketing, Sales, and Customer Service people. Broadband was the common term that was recognised by everyone with other terms associated with it rather than used instead of it. Think about the keywords you will be using which best cover the content you will publish. Use these keywords in your content to help your search engine pick up on them (search engine optimisation – SEO). The keywords should also be used most frequently by people to find your content. The more frequently you use a standard term rather than variations of that term, the more likely your content will be ranked higher in the search results. For example if instead of using the term ‘intranet’ you also used variations such as online environment, content management, accredited content, digital workplace, or inside the firewall, it will not have the same impact or findability (It will also be very confusing and possibly inaccurate too but you get the point I am making!). So, using these tips helps people to find your content and by doing this add to its value because of the extra thought and effort you have made when publishing it.